A fiend had snatched from me every hope of future happiness; no creature had ever been so miserable as I was; so frightful an event is single in the history of man. But why should I dwell upon the incidents that followed this last overwhelming event? Mine has been a tale of horrors; I have reached their acme, and what I must now relate can but be tedious to you. Know that, one by one, my friends were snatched away; I was left desolate. Frankenstein is not a book about an aloof monster slowly creeping about, freaking out people with his funny green skin, lack of intelligence, and incredible strength. It is a book about the tragedy of sin. It is a book about how you cannot run from your sin. Sin is devastating, destructive, and results in death. 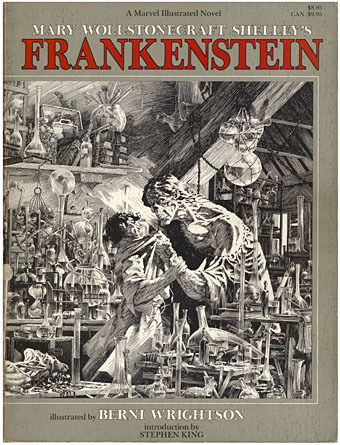 Young chemist Frankenstein ignores his happy upbringing, his father’s counsel, the counsel of a respected elder, and his future when he gives himself over to creating the monster. Like that piece of candy sitting on the counter all day, he cannot runaway from the allure of the power of performing his own creation. Just like many of those times when we yield to a temptation, he instantly despises it all, runs away, and hopes the monster, his sin incarnate, just disappears. It does not. While reading this book, I kept hoping for better, hoping for things to turn around, and for him to defeat this monster and move on to a better life with his sweet, innocent, and beautiful betrothed. But there is no happy story here. There is no victory. You ache for Frankenstein but you realize what a fool he was and that it’s all his fault. He is not innocent. This is such a convicting book. Sin is ugly and destructive and yet I run or yield to it all the time. For while I [the monster] destroyed his hopes, I did not satisfy my own desires. They were forever ardent and craving; still I desired love and fellowship, and I was still spurned. Can this Monster be Defeated? Frankenstein by Mary Shelley is a powerful book. It is about the tragedy of sin. It is about the sting of death. It is truly a book about a living nightmare and hell on earth. But she gives no solution. Frankenstein’s monster is never defeated and easily prevails. Is this reality? Only apart from Christ. Jesus died a horrific and gruesome death to satisfy the result of sin and bring victory. Christ became as ugly and repulsive as the monster, as our sin. Oh! No mortal could support the horror of that countenance. A mummy again endued with animation could not be so hideous as that wretch. I had gazed on him [Frankenstein’s monster] while unfinished; he was ugly then, but when those muscles and joints were rendered capable of motion, it became a thing such as even Dante could not have conceived. Just as in the book, Frankenstein, the monster is no funny monster or comic relief, sin is no joke. It’s not as simple as saying “We all make mistakes.” It would be the death of us. But praise God, Jesus stepped in and gave the monster one sweeping death blow for all time. The monster is still in us, fighting and persuading us, but he can only wound those in Christ. His power of death has been taken away. Someday soon, his death will be final and forever. As a Christian who just finished the novel, I greatly appreciated this post. Thank you!